Faculty World is an e-magazine for NIHR Faculty members. This issue focuses on Patient and Public Involvement and features interviews Simon Denegri (NIHR Director for Patient and Public Engagement in Research) and Margaret Hall (PPI Lead in Kent and Medway) plus lots more about PPI in the NIHR. The Secretary of State for Health, Jeremy Hunt has announced a new competition for up to twelve NIHR Collaborations for Leadership in Applied Health Research and Care (NIHR CLAHRCs) around the country, to ensure that the best evidence gained from research is applied directly to the NHS to improve the lives of patients. £120 million will be available for this scheme, which is part of the Government’s commitment to put the UK at the forefront of health research. The new funding builds on nine NIHR CLAHRCs established in 2008, as collaborative partnerships between a University and surrounding NHS organisations, which are now in the final year of funding. CLAHRCs undertake high quality applied health research focused on the needs of patients that supports the translation of research evidence into practice in the NHS. “Britain is one of the best research centres in the world and it is important that we harness the skills and creativity in this sector to really improve the lives of those who use the NHS. The department of health have produced a discussion paper on arrangements for supporting research in primary and community care. The paper aims to support local organisations, in collaboration with local networks, to consider how to achieve a smooth transfer of capability within the changing NHS for supporting primary and community care research. 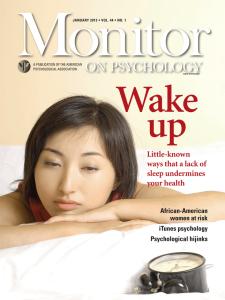 The CLAHRC CP study on Improving Access to Psychological Therapies, led by Professor Peter Jones, has been published in the January issue of Monitor. To view the article please see the digital edition of the magazine.